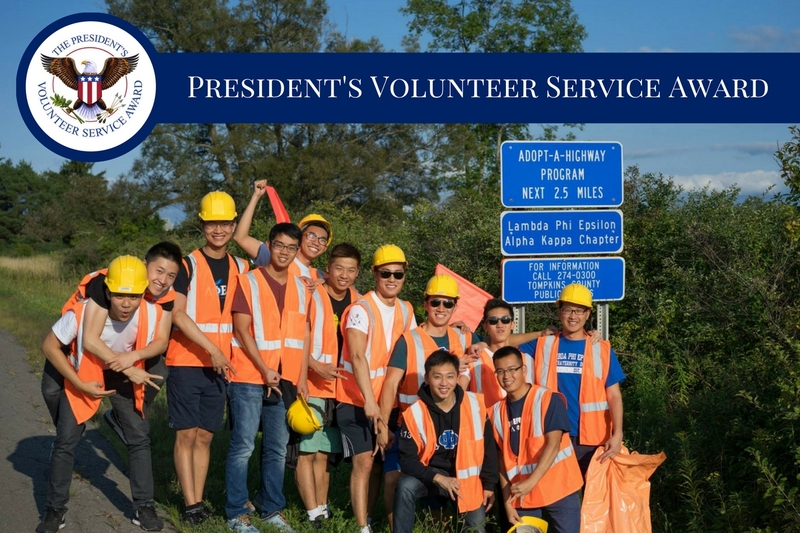 Saluting Service - Lambda Phi Epsilon International Fraternity, Inc.
New York, NY — Through a shared mission to inspiring more to answer the call to service, the President’s Volunteer Service Award (PVSA) celebrates the impact citizens can make in bettering their communities. Lambda Phi Epsilon has recently become a certifying organization for the President’s Volunteer Service Award, administered by the Corporation for National & Community Service, allowing the international fraternity to bestow Presidential recognition to its chapters and volunteers. “The roots of our organization’s philanthropy stems from the need to serve a fellow brother, Evan Chen, who passed away from leukemia. Brothers across the nation have led by example and built on the efforts of their fraternity. We can now better recognize the individual brothers and chapters who have gone above and beyond to inspire their fraternity, their community, and university through service,” says Victor Em, International Secretary for Lambda Phi Epsilon. Established by executive order in 2002, the PVSA was established to honor volunteers that give hundreds of hours per year helping others. Hours are measured over a 12-month period and awards are categorized based on cumulative hours. The awards are offered in multiple levels and are designed to recognize each milestone of a group’s service achievement. Levels include bronze, silver, gold and the President’s Lifetime Achievement Award for those who contribute over 4,000 hours of service. “Lambda Phi Epsilon is fueled and propelled forward by the passion of its volunteers. This partnership will allow us to recognize our actives, alumni, chapters, officers, and friends of the fraternity for their loyal and tireless contributions to the organization. We feel the tremendous work put forth by our volunteers deserves more than a verbal expression of gratitude,” says Bryan Dosono, Director of Communications for Lambda Phi Epsilon. Along with the profound honor of Presidential recognition, recipients will receive a personalized certificate, an official pin, medallion or coin, and a congratulatory letter from the President of the United States. The fraternity plans to recognize its inaugural set of PVSA recipients at its 2017 International Convention. The Corporation for National & Community Service is a federal agency that engages more than five million Americans in results-driven service each year via 70,000 community and faith-based organizations. Through Senior Corps, AmeriCorps, the Social Innovation Fund, United We Serve, the Dr. Martin Luther King Jr. Day of Service, the 9/11 National Day of Service and Remembrance and other programs, CNCS taps the power of citizens to improve lives, solve problems, strengthen communities and build the capacity of the nonprofit sector.